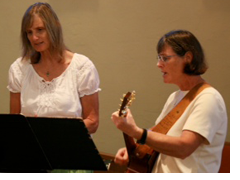 Those who offer their musical talents for leading the assembly in sung prayer are pastoral musicians that serve as accompanists, instrumentalists, cantors, and choir members. The Music Ministry enhances the liturgy with songs and instrumental music and also enriches the lives of the participants. Singers: Anyone with a love and aptitude for music is welcome. An ability to read music is not a requirement. Musicians: Anyone who can play an instrument at a proficient level is welcome. Parish Choir membership is open to all parishioners ages 16 and up.